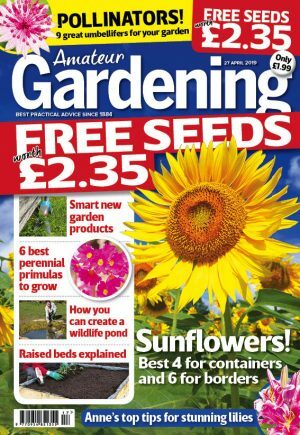 Christine Walkden has been voted TV Gardener of the Year 2014 by Amateur Gardening readers. She beat Gardeners’ World presenter Monty Don into second place. And last year’s winner Jim McColl of BBC Scotland’s The Beechgrove Garden came third. AG columnist Toby Buckland came fourth. Christine was presented with her award – which came as a surprise – by AG editor Tim Rumball during a recording of BBC Radio 4’s Gardeners’ Question Time. She said: “Half way through the show chairman Eric Robson interrupted proceedings, and Tim came on. Christine’s new series Glorious Gardens From Above has taken her in hot-air balloons over many of the UK’s best gardens. On the ground, she talks to the gardeners and learns stories behind the gardens. Aerial film taken by unmanned drones adds to the series’ unique beauty.